Very warm, tropical climate. The heaviest rainfalls are usually between December and April. The climate is best during the winter months, May to September, when there are moderate southeast trade winds. There is a local cyclone season from November to April. Lightweight cottons and linens throughout the year plus a warmer layer for cooler winter evenings, and rainwear for the wet season (December to April). 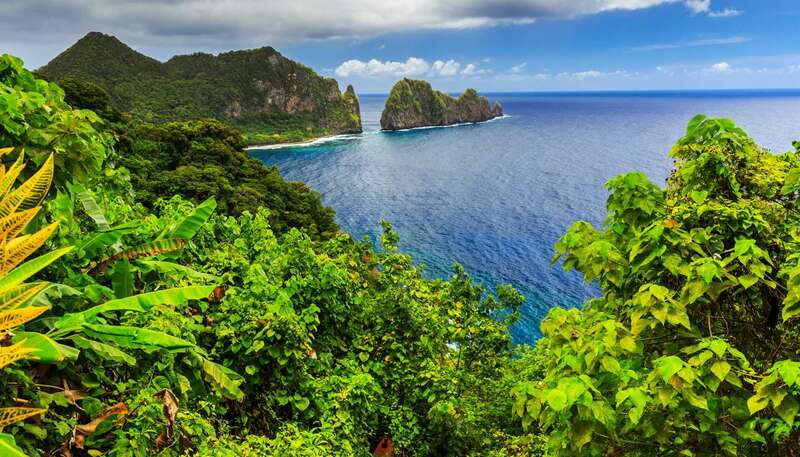 American Samoa lies in the Pacific Ocean approximately 3,700km (2,300 miles) southwest of Hawaii. It comprises seven islands: Tutuila, the largest with an area of 137 sq km (53 sq miles); Ofu, Olosega and Ta'u, known as the Manu'a group; and Aunu'u, Rose and Swain's. The Manu'a group is volcanic in origin and dominated by high peaks. Rose and Swain's Islands are uninhabited coral atolls, located to the east and north, respectively, of the other two island groups.